If you are passionate about playing indoor sports, you would do well to at least check out Cornilleau Table Tennistables. As the lead manufacturer of tennis tables for over 40 years, Cornilleau provides some of the most stable, beautiful and practical modelsaround. Cornilleau started in France in 1946, when Emile Cornilleau (from which the company is named) opened a joiner workshop in the town of Bonneuil les Eaux. Cornilleau Table Tennis is a very diverse and innovative brand. The compact table design was very novel when it was first introduced in 1995, and in 2005, they made the first 100% composite outdoor bat, a world exclusive! The table variety is impressive, ranging from hobby to officially approved tournament tables. Cornilleau products also feature the COMPACT technology, which is a revolutionary concept of table folding. Cornilleau designs are ergonomic and safe. Thanks to the patented Locking System mechanism that a Cornilleau table features, you can easily set yours on most if not all irregular surfaces. It employs four safety bolts, eight locking points for the playing position and an additional eight for the storing position. The unlocking handle is easy to use, providing comfort, ease of use and safety. This COMPACT technology is brilliant, and it helps reduce the risk of an accident. Cornilleau tables are also quite sturdy and have strong tops. The result is a good looking and solid table, and the finishing touches generate more spin to the ball. Customer reviews are also quite enthusiastic. You can leave your table outdoors, as it is designed to resist bad weather, thanks to its polyester net system. The bats are also worth mentioning. They are comfortable and easy to grasp. It is no wonder, as Cornilleau partnered with Michelin to develop its line of revolutionary TacteoBats. Combining Cornilleau’s extensive knowledge of table tennis and Michelin’s rubber manipulation technology, the TacteoBat is innovative, has a great design and is absolutely fun to use. And thanks to its high durability (it is both waterproof and shock resistant), it is simply unmatched by other similar products. 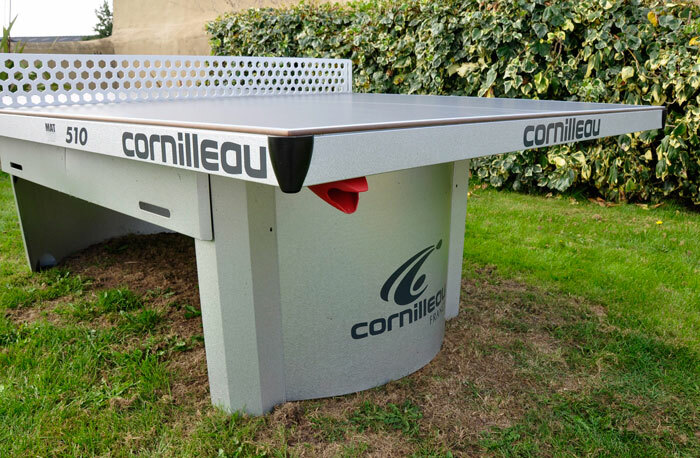 In short, if you want a fun table, with true spin to the ball and excellent outdoor performance, as well as a top-notch bat, then Cornilleau Table Tennis is the way to go.